It will be biggest joke if there comes a news that Congress leaders will undertake fast for a demand which is in the interest of Punjab. And this joke was in news recently. The Congress party decided to hold relay fast in Chandigarh demanding CBI inquiry into drug smuggling case after a drug lord Jagdish Bhola revealed some political names. This notwithstanding that the CBI is under the jurisdiction of Central Govt and it can inquire into any case at its own. So much in the past there have been many examples where CBI undertook investigations at the discomfort of state Govts. Even the Congress's prince whom they are projecting as Prime ministerial candidate had divulged two years ago that he has secret reports that about 70% youth of Punjab was addicted to drugs. Had the Congress been sincere towards Punjab it could have launched CBI inquiry then itself. But we all knew that those were crocodile tears that Rahul was shedding. Yet the naive Congressites commenced relay fast on Jan. 19, 2014 with much pomp and show. 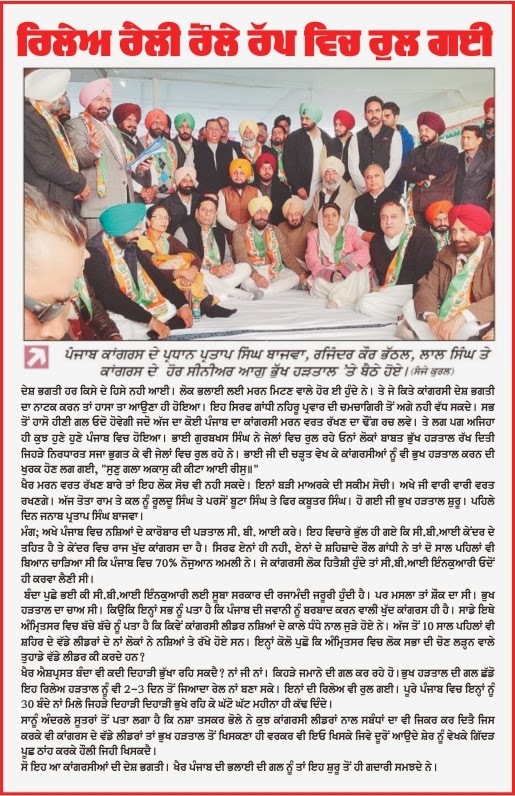 No surprise for the Punjabis the congressites could not arrange 30 workers who could remain hungry for a day. And the fast flopped for want of 'fasters'. Readers are aware how any talk of interest of the Punjab is considered as treason for the Congressites of Punjab. Obviously they have remained silent when their own Govt in Centre extended the subsidies to Punjab industries that will shift to neigbouring states. Just a one example but there are thousands in deed.